Refashioned in translucent frosted glass, the Daisy Marc Jacobs anniversary edition flacon is an elegant yet celebratory interpretation of the classic bottle. The center of the cap features large sparkling crystal stones surrounded by retro-cool daisy floral petals. To complement the bottle, the carton is presented in a soft gold finish, making it the perfect gift this holiday season.A sparkling floral bouquet of luscious strawberries, velvety violet petals and warm, soft white woods creates a unique charm. 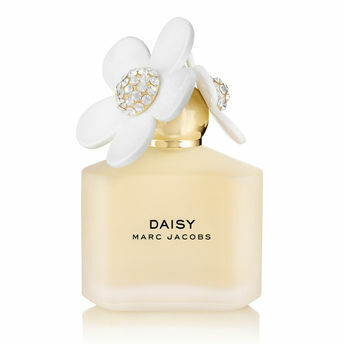 A special-edition release of the Marc Jacobs Daisy Eau De Toilette in celebration of the scent's 10th anniversary.The release features two new bottle designs: a limited-edition and a Deluxe version.To celebrate the beloved fragrance and its iconic design, Daisy Marc Jacobs introduces two luxurious limited edition bottles adorned with sparkling crystals that pay tribute to the daisy girl who is youthful, elegant, and lives life to the fullest.The Daisy Marc Jacobs Anniversary editions are a bold and striking addition to the daisy portfolio, elevating the fragrance to a new level of luxury and closing the year of daisy in style. Explore the entire range of Perfumes (EDT & EDP) available on Nykaa. Shop more Marc Jacobs products here.You can browse through the complete world of Marc Jacobs Perfumes (EDT & EDP) .